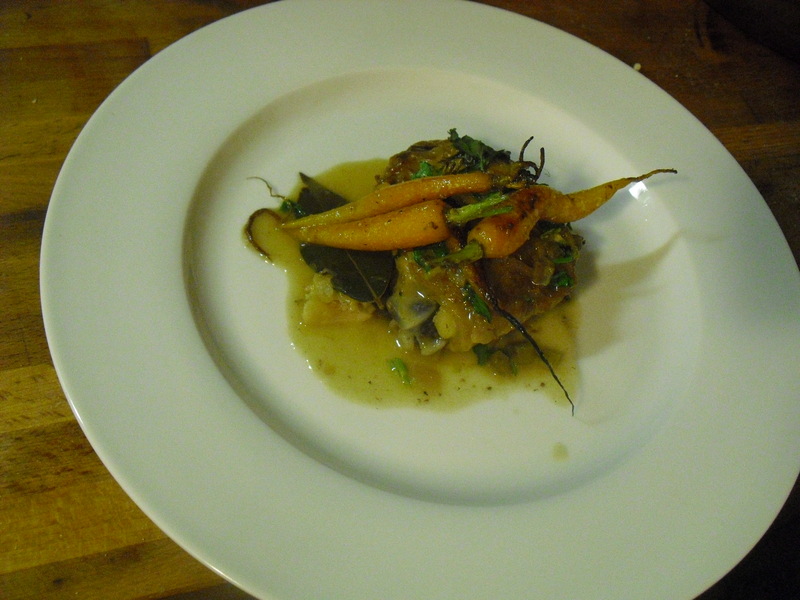 On the menu at the restaurant recently has been one of my favorite dishes: braised chicken with celery & bay leaves. I originally learned the recipe from Marcella Cucina, one of the splendid cookbooks of Marcella Hazan, who has been such a central influence in my own cooking. Marcella, in turn, learned the recipe from her friend Mara Martin of Ristorante Da Fiore in Venice. Many recipes in Italy are like this, passed down from friend to friend. Originality is far less important than cooking with love and attention. Here is how I make the dish for the restaurant. 1) Season six chicken thighs generously with salt, especially on the skinless side, where the salt will be absorbed more easily. 2) Ideally the chicken should rest and absorb the seasoning for an hour or two while coming to room temperature. If really pressed for time, just proceed to the browning. 3) Pat the chicken dry, and brown with olive oil in 1 large or 2 medium pans. 4) Remove the chicken from the pan(s) and drain off most of the rendered fat. Add more olive oil, and soften about ½ cup chopped onion over medium heat. Allow it to gain a little color, then add 1/4 cup of chopped celery and 2 medium garlic cloves, smashed. 5) A minute or two later, add several bay leaves, a small handful of parlsey leaves (chopped or whole), and a ½ cup or so white wine or broth to deglaze the pan. 6) Return the chicken to the pan and cook for an additional 45 minutes or so, either simmering gently on the stove top with a lid askew on the pan, or in the oven at 325 degrees with no lid. Regulate the amount of liquid so that nothing begins to stick or burn. 7) Garnish with a small pinch of chopped parsley or chopped celery leaves and serve. No…I forgot it! Sorry…It has been fixed. Let me know how it turns out for you.